Mistwalker studios was founded by the creator of Final Fantasy, so I always keep an eye on what they do. I don't always end up enjoying their games, but I like to give them a shot. That brings us to Terra Battle. It's a new game by Mistwalker studios and I've been playing it for the last couple days. 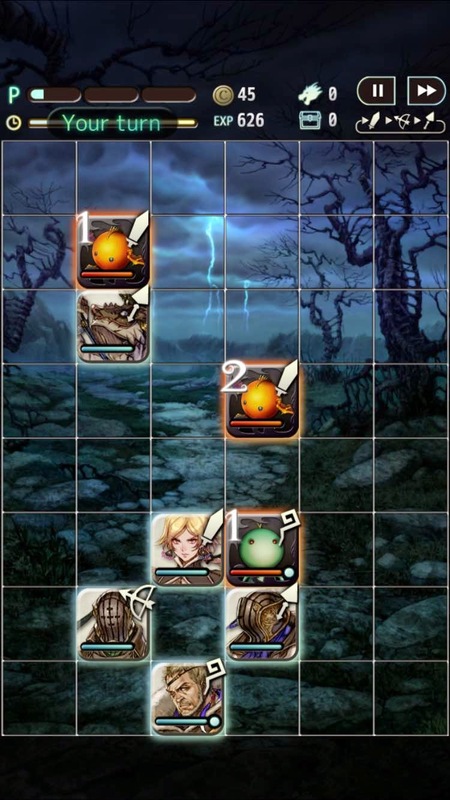 Terra Battle is a puzzle RPG game on iOS and Android. For reference, I've been playing it on my iPhone. It has some basic free-to-play mechanics. There's a stamina system that slowly refills over time. It costs a couple stamina to start a battle. That hasn't actually limited my playtime at all. I've never run out of stamina to the point where I couldn't do another battle. It recharges really fast. They also have a shop where you can buy heroes and items for real world money. I haven't spent anything and I don't plan to. The basic mechanics of the game are really interesting. Use two or more units to flank an enemy and they will attack together. Any other units that are in straight line of sight with the two units who are launching the attack they will also add their attacks to the battle. It takes some basic positional thinking, but it's not too complicated. The weird (and interesting) part is what actually happens during a turn. You can move your unit an unlimited number of spaces by dragging them around but you're limited by time. You have about five seconds to move your unit. If you move your unit through another friendly unit it will cause that friendly unit to shift position. Although your unit drag time is limited, your thinking time between drags is infinite. What this means is that if you're fast enough and think ahead you can include every unit in every attack on every single turn. Now, this will almost never happen but it's a fun goal to aim for. Do you think you're fast enough to nudge every unit into position with the unit you're dragging? It's a gamble, but a fun one. If you misjudge, the character you're dragging will end up totally out of position. It's all part of the risk/reward trade-off present on every turn. I could see this game being a great game to play for a few minutes here and there every day. I only have one problem with it. The battles are a bit too long. For a game that does so much right on mobile I'm surprised by how long the battles are. Each battle is divided into five different phases. Any given phase doesn't feel too long but put together the whole battle can get up to fifteen minutes. I think if there were two or three phases per battle it would fit into my schedule much better. I often have five minutes to give to a game but I don't always have fifteen. This is completely a personal preference. If you don't have two kids and a full-time job like me you probably have more free time. If fifteen minute gameplay sessions fit into your schedule then you owe it to yourself to give this game a shot. After all, it is free.